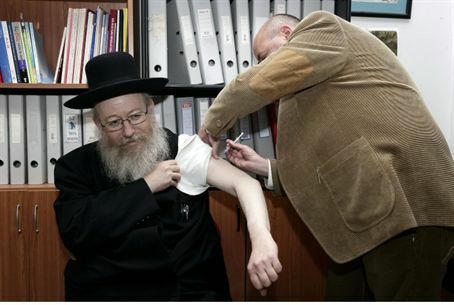 Deputy Health Minister Yaakov Litzman responds in kind to self-styled celebs who cursed him and the government. Deputy Health Minister Yaakov Litzman (United Torah Judaism) spoke before the Knesset plenum Wednesday and responded to recent invective and harsh statements made by leftist media personalities against him and Prime Minister Netanyahu's government, concerning the doctor's strike. The strike has become more strident and was marked by the head of the Doctor's Union beginning a hunger strike and a much-publicized march to the Prime Minister's office. The doctors, who also want a wage hike, claim that Israel's medical care is collapsing, hospitals are overcrowded and interns' workloads and shifts are untenable. They accepted the offer made to them by the Treasury Ministry and then refused it on second thought, after the interns protested that their needs were not met. Israeli medicine is socialized and Israeli doctors who do not have private practices earn wages that are immeasurably lower than their USA counterparts. Litzman told the plenum: “I heard that the author Yoram Kaniuk recently wished that ‘the name of the government be erased’ [Kaniuk used the curse 'Yimach shma' -- Ed.]. This is a curse usually wished upon the memory of the Nazis and enemies of the Jews. Is this his style of writing?" “And then there’s a radio personality, Natan Zehavi. He said he opposes doctors taking 28-hour shifts. He was asked if he agrees with my request to reduce the shifts to 18 hours. Zehavi responded that ‘Litzman’s tongue should be cut out,' another curse. "I don’t know who these people are. I have no respect for them. Why is this rampant incitement being broadcasted? There is a special ward in the Abarbanel Facility for the mentally ill just for people like them. Incitement can also lead to violence. I must protest,” Litzman said. Yoram Kaniuk is an Israeli writer, known for his extreme left views. He spoke at a demonstration at the Tel Aviv Ichilov Hospital which was part of the ongoing doctors' strike. He thanked the doctors for their tireless efforts to improve the health situation in Israel, and expressed his appreciation for Ichilov Hospital. Outspoken journalist and radio personality Natan Zehavi had addressed MK Litzman with harsh invective on his program ‘Angry Zehavi’ on Israel's Non-Stop Radio channel.